Perennial climate-change alarmist Dana Nuccitelli is upset—as always. This time, it’s because Donald Trump nominated Congressman Jim Bridenstine (R-OK) to become the next administrator of NASA. A little fact checking might have saved them some embarrassment. But before we get to that, an aside will be helpful. That’s how they justify ignoring the group of distinguished retired NASA engineers who call themselves The Right Climate Stuff team. By application of the principles of radiative heat transfer, TRCS members have concluded that human influence on climate is minimal and couldn’t become catastrophic even if we burned all the fossil fuels in the earth’s crust. So as you read on, keep in mind that to climate alarmists, engineers aren’t even scientists, let alone climate scientists. So if non-scientists aren’t qualified to lead NASA, engineers are excluded. Twenty people have been NASA administrator or acting administrator. Of those, twelve have been engineers. The second most common background? Administration—three (or four, if you include one whose master’s was in information systems), for each of whom the most advanced degree was a master’s in administration or management. Physicists come in second place—all two of them. Bridenstine’s most advanced degree? A master’s in business administration. So he has the same highest degree as three past NASA administrators. How many of NASA’s twenty past administrators have had degrees in (non-engineering) science? Three—all with Ph.D.’s, the two in physics plus one in chemistry. But climate alarmists also routinely dismiss physicists (like S. Fred Singer and Will Happer) and chemists as unqualified to address climate change because they’re not “climate scientists.” So apparently Nuccitelli and company wouldn’t have been satisfied with these three administrators, either. Five administrators had no degree higher than a bachelor’s—all in engineering. Among them are current Acting Administrator Robert M. Lightfoot Jr.; NASA’s first administrator, T. Keith Glennan (1958–1961); and its longest-serving, Daniel S. Goldin (1992–2001). Seven administrators’ highest earned degrees were doctorates (four in engineering, two in physics, and one in chemistry), seven were master’s (three in engineering, two in administration, and one each in information systems, systems management, and law), and five were bachelor’s (all in engineering). 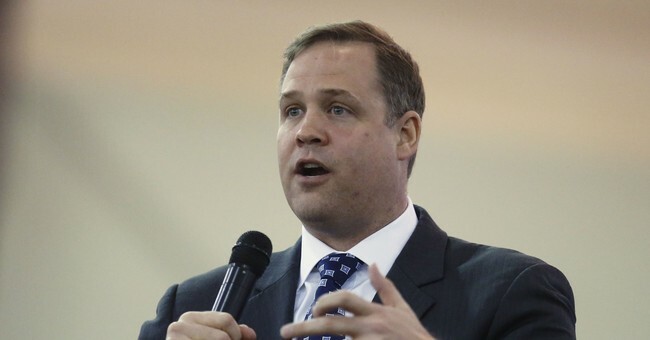 In short, Bridenstine—a former Navy Reserve pilot, former executive director of the Tulsa Air and Space Museum and Planetarium, current member of the House Science, Space, and Technology Committee, and an avid backer of space exploration (NASA’s chief mission)—is equally well qualified as many past administrators to lead NASA, and better than some. … global temperatures stopped rising 10 years ago. Global temperature changes, when they exist, correlate with Sun output and ocean cycles. During the Medieval Warm Period from 800 to 1300 A.D. … temperatures were warmer than today. But every one of those claims is either patently or arguably true. and I could cite more. Bridenstine’s claim in 2013 was well justified by the data—and remains so today. Other scientists contest this, but Bridenstine’s claim is at least arguably true. After applying the latest big data technique to six 2,000 year-long proxy-temperature series we cannot confirm that recent warming is anything but natural—what might have occurred anyway, even if there was no industrial revolution. … There are, however, multiple lines of evidence indicating it was about a degree warmer across Europe during the MWP—corresponding with the 1200 AD rise in our Northern Hemisphere composite. In fact, there are oodles of published technical papers based on proxy records that provide a relatively warm temperature profile for this period. So Bridenstine is at least arguably right on that claim, too. Perhaps the NASA administrator with the broadest and deepest scientific credentials was Michael Griffin (1,377 days from 2005–2009, the sixth-longest reign of any administrator), with a Ph.D. in aerospace engineering, an M.S. in electrical engineering, an M.S. in applied physics, an MBA, an M.S. in civil engineering, and partial completion of an M.S. in computer science before he took office. So Griffin wouldn’t have pleased Nuccitelli and company either. After initial objections, Bridenstine seems to have growing support, according to the Washington Post. He should. He’s well qualified for a position that has far more to do with management than with science—even the science of space exploration, NASA’s main mission, let alone climate change, a sidelight.